“Now that the beginning of the year is well and truly behind us, thoughts should start to turn to spring calving. 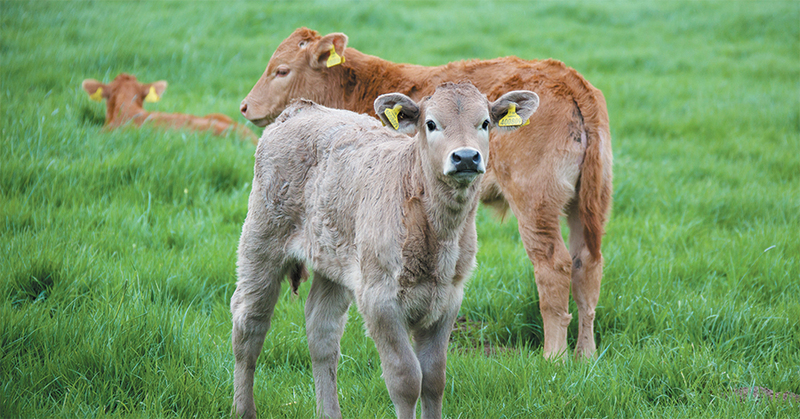 Time spent planning now will be time well spent to ensure problems are minimised,” says Keith Cutler, Veterinary Surgeon at Endell Veterinary Group and a member of the National Beef Association’s (NBA) Animal Health Committee. Here, on behalf of the NBA, Keith discusses further that organisation is the key to calving success. The aim is that your cows will all calve easily and unaided delivering a vigorous, live calf. To do this they need to be in a ‘fit not fat’ body condition. Too fat and the diameter of the birth canal may be reduced resulting in a difficult or prolonged delivery which may affect calf viability. Too thin and the cow may lack the stamina to push the calf out. Colostrum quality and quantity is also likely to be poor if cows are too thin. If you are worried about colostrum quality it can be measured easily using a colostrometer. If colostrum quality is poor intakes can be supplemented, ideally using a bottle and teat but via a stomach tube if necessary. Colostrum from a donor cow will provide antibodies specific to pathogens present on your farm. Additional antibody content can be stimulated by vaccinating the donor cow against E. coli, rotavirus and coronavirus between twelve and four weeks prior to calving. Care should be taken, however, as it is possible for some pathogens (for example Map which is the cause of Johne’s disease) to be transmitted in colostrum. If donor colostrum of high quality from a known health status animal is not available, either fresh or frozen, various freeze dried colostrum replacers are available and may be useful in an emergency situation. “Although calves are born with a fully functioning immune system they do not have any passive maternal immunity because antibodies from the cow cannot cross the placenta,” continues Keith. Colostrum, as well as providing nutrition, is vital in providing this passive maternal immunity, but antibodies can only be absorbed efficiently before ‘gut closure’ which begins within hours of birth. Calves therefore need to suckle as soon after birth as possible. The recommended amount of colostrum varies between different authorities; however, more recently it has become common to recommend 10% of the calf’s body weight within five hours, again repeated before a day of age. In truth, an exact amount is not important; new born calves need a lot of good quality colostrum quickly. No matter how much colostrum is taken by your calves and how good its quality you should not forget that disease is a complex interaction between pathogens, the immune system and the environment. It is important to remember that if the attacking pathogens are overwhelming then the immune system will be defeated. As well as ensuring an early and adequate passive maternal immunity through colostrum intake, it is vital to reduce the pathogen challenge to your new born calves. Calving paddocks should be clean and well drained and calving yards and boxes bedded with fresh, clean bedding. One of the main routes by which pathogens are able to infect calves is through the navel. The application of clips and antibiotic spray may help reduce the risk. However, an antiseptic solution, such as Strong iodine BP, which dries the navel at the same time is recommended. This should be applied liberally as soon as possible after birth. If the cow licks it off there is no harm in a second application a few hours later. It is also useful to plan now for what you will need when inevitably a difficult calving presents. How are you going to handle the cow, especially if your animals calve outdoors? Is your calving aid in a good state of repair? Do you have clean ropes or chains and plenty of obstetrical lubricant? Have you got stimulants, a supply of colostrum or colostrum replacer and a clean stomach tube? A little time spent planning now will ensure that everything required to deal with the emergency is all to hand when it is needed.